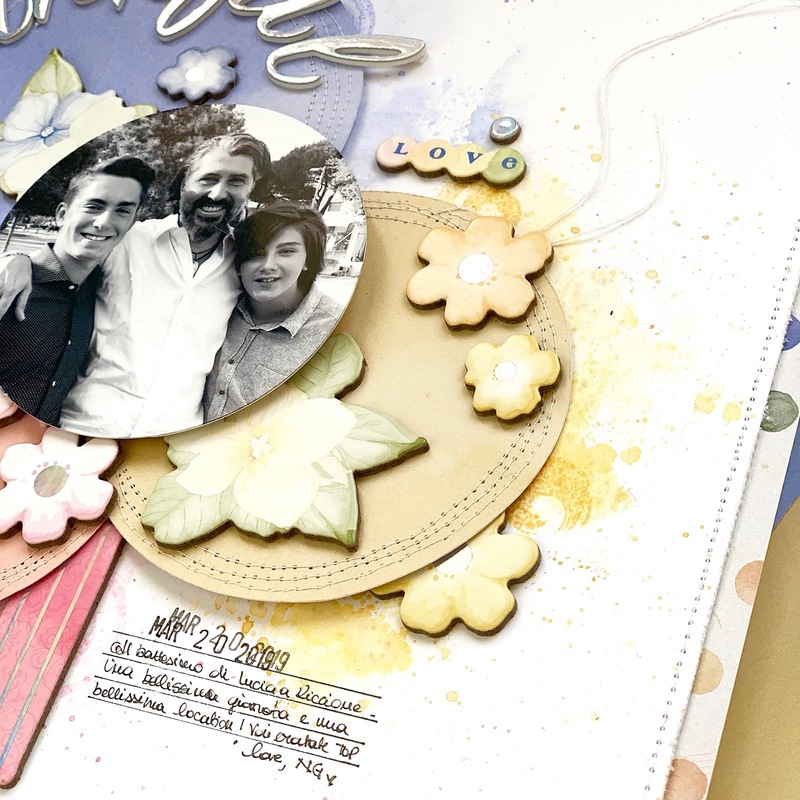 It's Angela here sharing a scrapbook page featuring the new charming Harmony collection. 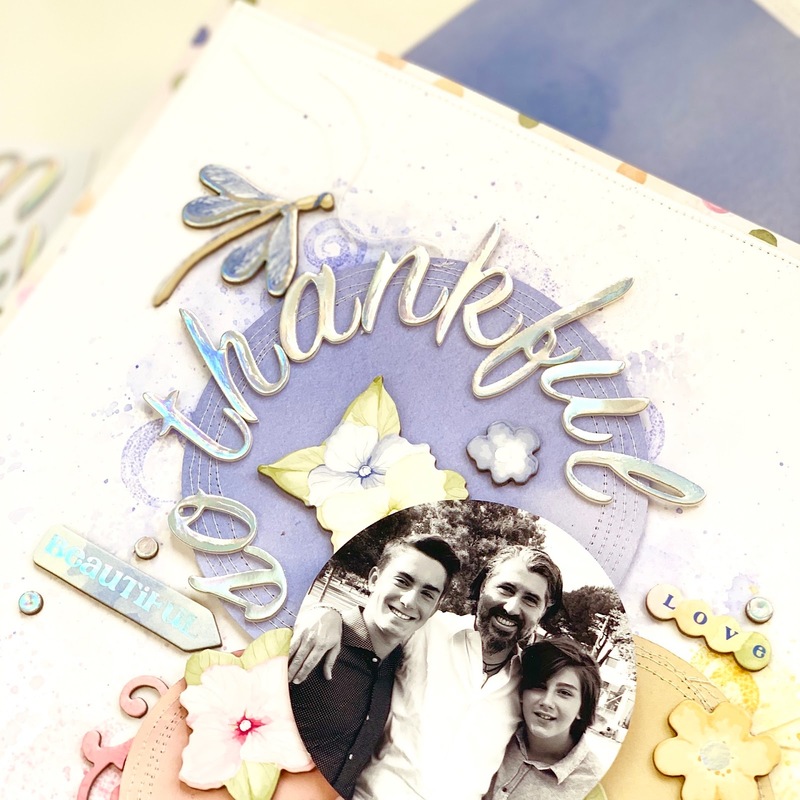 It's a fresh and tender collection with mainly pastels and lots of birds and flowers, perfect for spring projects for the coming sunny days. I started my layout choosing the color combo and I went for this trio: slate blue, light ocher and salmon. They match beautifully together. I love these shades also because they aren't perfectly solid, they have a soft watercolor effect. So, I cut 3 circles, one from each color, using the We R Memory Keepers Circle Spin & Trim. I cut a 5" circle in blu, a 4" circle in ocher and a 3" circle in salmon. I also cut my photo in a circle shape of 3" and 1/2. Then, I arranged the circles so that they slightly overlap each other and I put the photo in the center. Before adhering the circles, I stitched each one with my sewing machine. Then, I prepped the background. I used a smooth heavy white cardstock and I marked the position of the different circles on it. I colored and splattered the cardstock using Distress Inks that matched my circles, it means shaded lilac, scattered straw and spun sugar. To add more interest, I also stamped a few circles with the Painted Circles stamp set by BoBunny using the same Distress Inks colors. 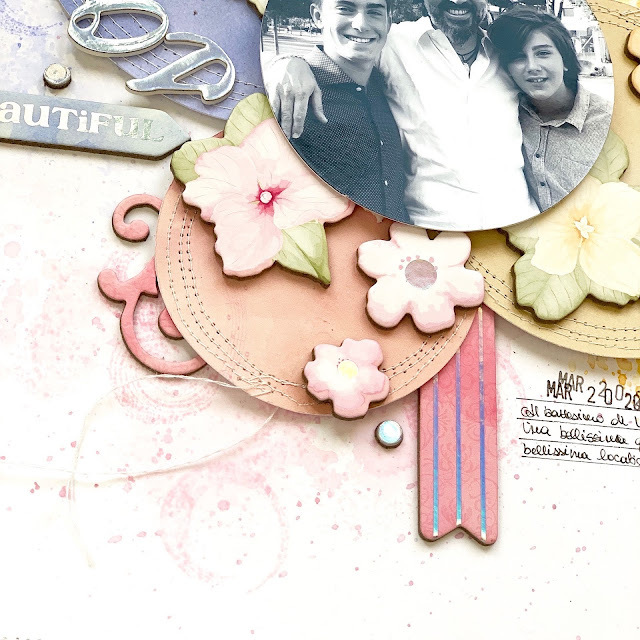 When everything was dry, I sticked in place the circles and started embellishing the page. My idea was to keep everything inside the circles creating a kind of color clusters. So, I placed the title on the blue circles, because it was the biggest. According to my initial idea, I added yellow flowers on the yellow circles, pink flower on the salmon circle and so on. For the journaling, I added a brief description of the photo by hand, but before doing it I drew a few lines for being sure to write straight. Here is a close up of the clusters. As you can see, I used dimensional foam adhesive to have different height. In some places, like in the photo, I even used two pieces of foam tape, one on the other. Last, I trimmed 1/4 of inc all around the page, I sewed all around and adhere it to a multicolor polka dots paper for framing the layout. That's all for today my crafty friends. 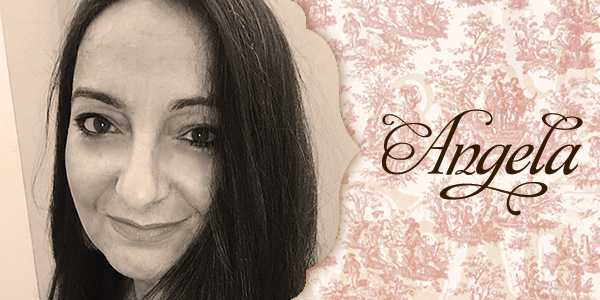 Thanks for stopping by, I hope you feel inspired by my layout and by the beautiful Harmony collection. I love your soft colour. A dragonfly on the left is such a tiny detail, but a beatiful jewell. I like it!! !